In a previous blog, I talked about how I had the opportunity to travel to New Zealand, and provided you with some recommendations for fun activities — ranging from whale watching to hiking a glacier. 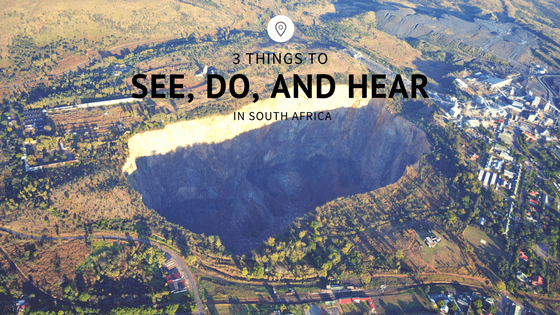 Since I have traveled to so many countries, I’d like to keep with the theme of “Things to See, Do and Hear” by writing my next blog about South Africa. We’ve known for awhile now that all humans originated from the African continent. If you’re taking a trip to South Africa, you should have the Cradle of Humankind World Heritage Site high on your priority list. At about an hour and a half drive away from Johannesburg, the historical site offers visitors the opportunity to learn about ancient stones and bones that populated the Earth thousands of years ago. Although there are eight heritage sites in the country, Cradle of Humankind is special because it’s considered to be the world’s richest hominin site with around 40 percent of the world’s human ancestor fossils at this location. These aren’t your average doodles you see your kids making in art class. Roughly 500 ancient and intricate drawings were left behind by the San Bushmen, who were the original inhabitants of southern Africa, many years ago. The Bushman Cave Museum, which is located in the Drakensberg mountains, has these paintings permanently open to the public. Made of blood, animal bile, egg-white and ochre, the San Bushmen drawings are revered by historians for their simplicity of design and bold use of color. In fact, the San Bushmen art is so well known that they are considered to be the most advanced cave drawings in the world. Because these drawings are so sacred, the rock art sites are protected as a national heritage location, and mountain hikers aren’t allowed to use these caves as shelter. You can’t take a trip to Africa without exploring its natural beauty by going on a safari. Participants who go on this luxury safari will get to experience Kruger National Park with exclusive access to the Sabi Sabi Private Game Reserve, as well as private tours of the African bush where that go further into the brush than the usual tours do. Participants will rest each night in the region’s most luxurious lodging options and enjoy top-notch service on this safari. Where in the world will I take you to next? Find out by staying tuned to my blog!